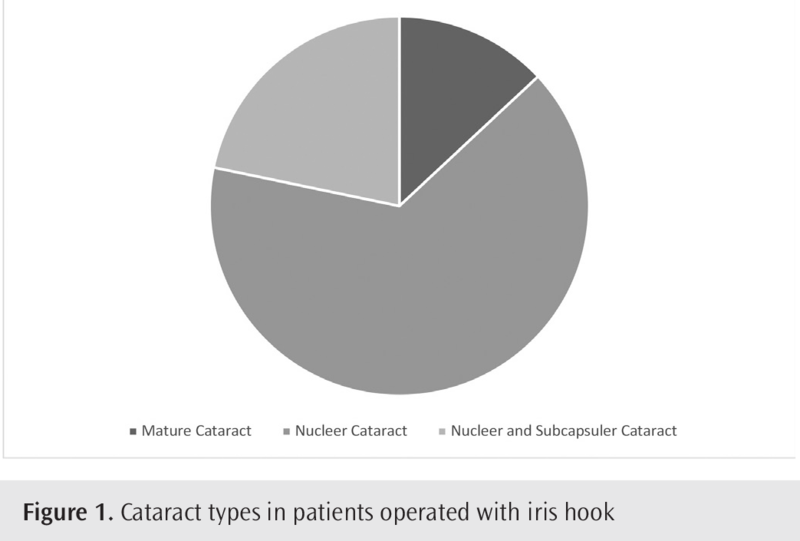 We aimed to evaluate the clinical results of cataract surgery performed using iris hook in our clinic. The medical records of patients who underwent cataract surgery via phacoemulsification with intraocular lens implantation (PHACO+IOL) that was performed using iris hook were reviewed retrospectively. The patients were evaluated in terms of cataract type, associated ocular diseases, pre-operative and post-operative best-corrected visual acuity (BCVA) and intraocular pressure (IOP). Out of 3020 eyes treated with PHACO+IOL, iris hook was used in 21 eyes. The mean age of these patients (15 men/8 women) was 71.9±12.1 (range=30-90) years. Thirteen percent of patients had mature cataract, 65.2% had nuclear cataract and 21.7% had nuclear+posterior subcapsular cataract. Regarding associated ocular diseases, it was shown that 43.5% of patients had pseudoexfoliation syndrome and 30.4% had primary open-angle glaucoma. Additionally, 34.8% of patients had hypertension, 4.3% had diabetes mellitus and 17.4% had hypertension+diabetes mellitus. Forty-three point five percent of patients had no history of systemic diseases. Capsular tension ring was used in 13% of surgeries. No posterior capsular perforation was detected. A 3-piece hydrophobic, acrylic, foldable IOL was implanted in-the-bag position in all eyes. Mean pre-operative BCVA was 0.18±0.13 (Snellen visual acuity chart) and mean post-operative BCVA was 0.32±0.23. The mean change in BCVA was 0.15±0.25 and this change was statistically significant (p=0.010). BCVA increased in 65.2% of the patients (n=15), decreased in 21.7% (n=5) and remained the same in 13% (n=3). Mean preoperative IOP was 19.65±5.07 and mean post-operative IOP was 17.26±5.76. The decrease in IOP was not statistically significant (p=0.078). Although cataract surgery is a risky condition in patients with narrow pupils, our results with iris hook were satisfactory. Cataract surgery via phacoemulsification (PHACO) becomes more difficult and more complications are encountered when the pupil width is smaller than ideal. Pupil dilatation may be inadequate despite the use of pre-operative mydriatic eyedrops or intraoperative injection of 0.1 cc adrenaline solution (adrenaline was diluted into balanced salt solution (BSS) to prepare an adrenaline concentration of 0.20 mg/mL) into the anterior chamber prior to capsulorhexis in case of pseudoexfoliation syndrome, uveitis, diabetes mellitus, systemic alpha-1A adrenoreceptor blocker use, previous ocular trauma and iridoschisis (1). Preoperative mydriatic eyedrops are used to ensure the ideal width of the pupil. These eyedrops may be instilled even when the patient is admitted to the operating table. Diluted adrenaline injection into the anterior chamber helps the pupil to dilate. For a more rigid dilatation of the pupil, this should be done in such cases. However, caution should be taken in patients with cardiac disease and severe aortic stenosis. Pupillary stretching is a method used when these methods do not work. Sector and radial iridectomy with sphincterotomy are methods that can be used to provide pupillary dilatation, but cause permanent effects on iris anatomy. In order to dilate the pupil mechanically, ring-shaped pupil expanders and iris hooks placed separately from small corneal incisions may be used. Iris hooks were first used by McReynolds in 1977. The first used iris hooks were metallic and non-foldable, and nylon and foldable hooks have been used in the following years. Foldable hooks were first used in vitreoretinal surgery, but Nichamin was first to use foldable hooks for cataract surgery in 1993. Iris hooks are used to increase the pupil width and contribute to the reduction of complication rates. In this study, the surgical results of patients, in whom the pupil dilatation was inadequate during the cataract surgery via PHACO and foldable iris hooks were used, were investigated retrospectively. The medical records of patients who underwent cataract surgery via PHACO with intraocular lens implantation (IOL) that was performed using iris hook between January 2014 and December 2015 in our clinic were reviewed retrospectively. Age, gender, cataract types, concomitant pseudoexfoliation, concomitant systemic diseases, ophthalmic and systemic drugs, additional devices used during operation and peroperative complications were recorded. All surgical methods and per-operative conditions were recorded from the patients’ detailed discharge forms. Postoperative visual acuity, intraocular pressure (IOP) and anterior segment examination findings of the patients were obtained from patient follow-up cards. The data were evaluated statistically. Ethics committee approval (İstanbul Training and Research Hospital no: 1016) was obtained for the study. The study was conducted in accordance with the Declaration of Helsinki. All patients were informed about the study and their consent was obtained. The surgeries were performed by a single surgeon. Tropicamide (tropamid® 1%, Bilim İlaç Sanayi ve Ticaret AŞ, İstanbul, Turkey), cyclopentalate hydrochloride (sikloplejin® 1%, Abdi İbrahim İlaç, İstanbul, Turkey) and phenylephrine hydrochloride (mydfrin® 2.5%, Alcon Laboratories Inc., Texas, USA) were administered to each subject’s eye to be operated with a half-hour intervals beginning two hours before the surgery. The last drops were administered when the patient was admitted to the operating table. Diluted adrenaline was injected into the anterior chamber after the first side entrance to the cornea. The volumetric effect of the viscoelastic material was used to increase the pupillary dilation. The viscoelastic agent was injected into the pupilla border. Pupillary stretching was performed in order to increase pupil dilatation. In cases where adequate pupillary dilatation could not be achieved with all these procedures, 4 iris hooks were implanted from the lateral corneal incisions. The side entries made for implantation were more perpendicular and smaller in width. In order to have a symmetrical pupillary dilatation, the incisions from which the iris hook will be implanted were performed at a 90-degree angle between the two incisions. After IOL implantation, the iris hooks were taken out of the pupil before the viscoelastic material was removed from the eye. After the viscoelastic material was cleaned, the incisions other than lateral incisions used for the passage of the iris hooks were sealed with BSS. SPSS 15.0 for Windows (SPSS Inc., Chicago, IL, USA) program was used for statistical analysis. Descriptive statistics were expressed as number and percentage for categorical variables, and mean, standard deviation, minimum and maximum for numerical variables. Comparison of two related groups was performed using Paired t-test or Wilcoxon test, where appropriate. Comparison of two or more independent groups was performed using One-Way ANOVA, Kruskal-Wallis test, Mann-Whitney U test or Student’s t-test, where appropriate. Relations between numerical variables were examined by Spearman tests correlation analysis since the parametric test condition could not be provided. Statistical significance was accepted as p<0.05. A total of 3020 PHACO+IOL implantation were performed in our clinic between January 2014 and December 2015, and iris hook was used in 21 (0.7%) cases. The mean age of these patients was 71.9±12.1 (minimum-maximum=30-90) years. Fifteen (65%) of the patients were male and 8 (34%) were female. Regarding cataract type, 3 (13%) had mature cataract, 15 (65.2%) had nuclear cataract and 5 (21.7%) had nuclear + posterior subcapsular cataract (Figure 1). Seven (30.4%) of the patients had a pre-diagnosed glaucoma and these patients were under antiglaucoma treatment. 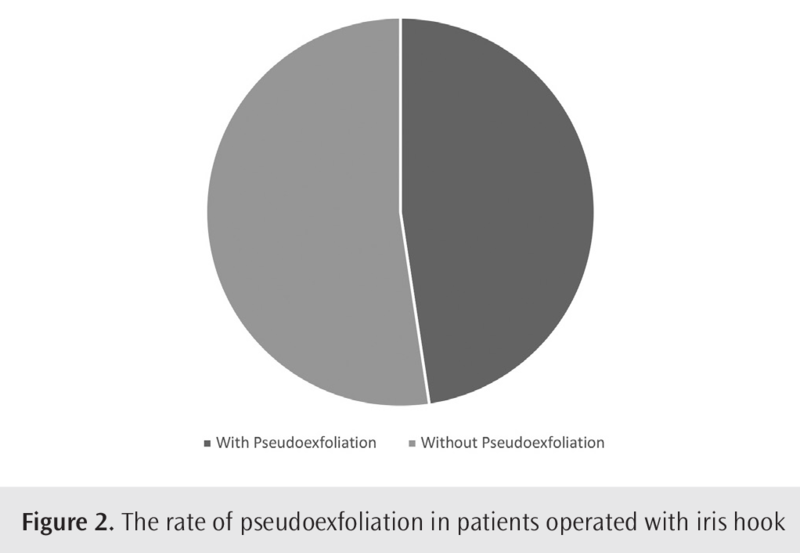 Biomicroscopic evaluation revealed pseudoexfoliation in 10 eyes (43.5%) (Figure 2). Systemic disease evaluation revealed hypertension in 8 patients (34.8%), diabetes mellitus in one (4.3%) and hypertension + diabetes mellitus in four (17.4%) patients. There was no history of systemic disease in 8 (43.5%) patients. It was determined that 3 (13%) patients had capsular tension ring implantation due to insufficient zonular support. None of the patients had posterior capsule perforation and no aphakic patients were observed (Table 1). When the recorded ophthalmologic examinations were evaluated, it was observed that mean preoperative visual acuity was 0.18±0.13 (Snellen visual acuity chart) and mean post-operative visual acuity was 0.32±0.23. The mean change in visual acuity was 0.15±0.25. 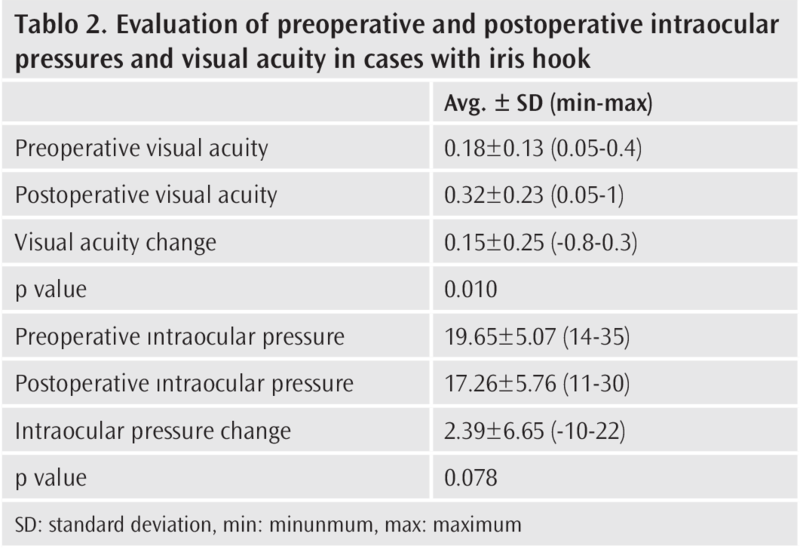 Postoperative visual acuity improvement was statistically significant (p=0.010). Regarding IOP measurement with applanation tonometer, mean preoperative IOP was 19.65±5.07 and mean postoperative IOP was 17.26±5.76. The mean change in IOP was 2.39±6.65. This decrease in postoperative IOP was not statistically significant (p=0.078). IOP decreased in 16 patients (69.6%), increased in 4 patients (17.4%) and remained the same in 3 patients (13%) (Table 2). 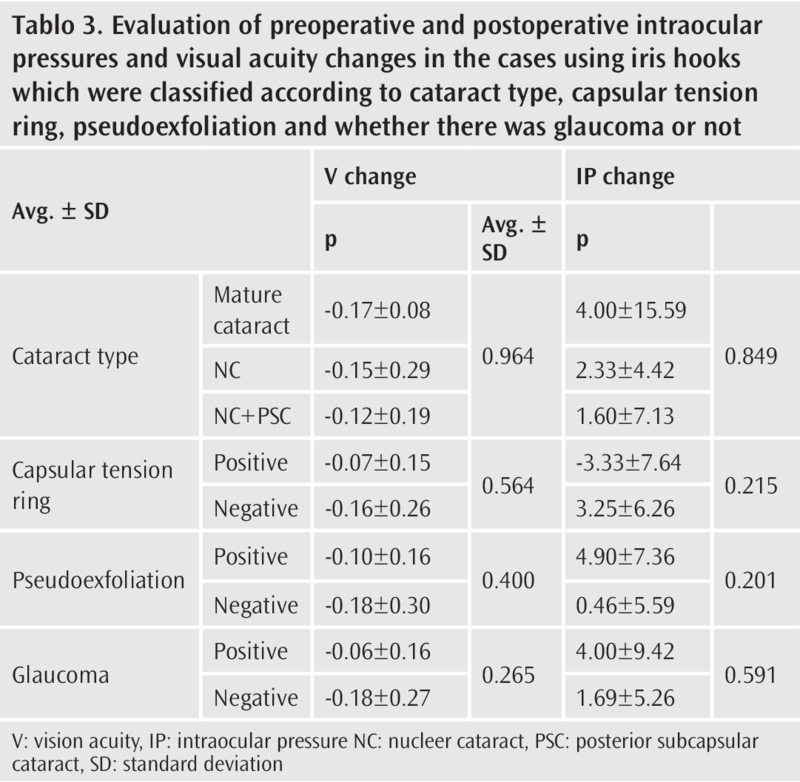 When the patients were classified according to cataract type, capsular tension ring implantation, presence of pseudoexfoliation and glaucoma, no statistically significant difference was observed in the rates of changes in pre-operative and postoperative visual acuity and IOP values ​​between the groups with and without these conditions (Table 3). Complications can occur during PHACO surgery even if the ideal ophthalmologic and surgical instruments are provided. Complications are related to the surgeon’s knowledge, experience, and immediate motivation, as well as preoperative systemic and ocular preparations (2). The most important ophthalmological preparation for ease of surgery and reduction of complication rates is to provide pupil dilatation before surgery. It has been shown in many studies that the complication rates have increased in case of insufficient pupillary width during cataract surgery (3). Complications such as iris trauma, iris tissue damage due to aspiration, iridodialysis, hyphema, zonular damage, posterior capsule rupture and the replacement of cataract material into the vitreous and resulting vitreous loss can be observed in cases with narrow pupils (4). In general, this preparation with preoperative mydriatic eyedrops may not always work completely alone. Some surgeons do not do dilatation at the examination one day before the surgery to prevent pupil fatigue. Again, some surgeons do not start dilatation procedures in the early morning hours for surgeries scheduled to start later in the day. Local anesthesia performed for the operation has an effect on pupil dilatation. Vielpau et al. (5) reported that subtenon anesthesia was a more effective method in providing pupil dilatation compared to other types of local anesthesias. Subtenon anesthesia may be preferred in such cases. If the pupil is not dilated sufficiently, the surgeon will not be able to see the capsule area enough for capsulorhexis; however, even though the pupil is dilated up to 4 mm, it will be difficult to select the area where the capsule is opened during capsulorhexis, as the fundus reflux is insufficient. In this case, the risk of capsulorhexis tip to go to the periphery is arisen. There is a risk that the capsulorhexis tip heading to the periphery is entangled to the posterior capsule and this may cause fragmented lens materials to fall into the vitreous during PHACO surgery. During the PHACO surgery with narrow pupils, some of the lens materials and cortex fragments may be retained by the iris and these fragments may remain in the eye as a residue. Since it is more difficult to observe the effect of the manipulations on the capsule in cases where the pupil is narrow, the development of tears in the capsule and the damage of the zonules affected by the forces acting on the capsule can be possible (6). During the surgery, the formation of tears may cause dislocation of the lens particles into the vitreous. In cases where capsule integrity deteriorates, it is difficult to implant the IOL into the capsule. In cases with zonular damage, a capsular tension ring may be required for the capsule tension to be 360 ​​degree balanced (7). The capsular tension ring can also be used many years after surgery in order to fix the ring to the sclera and return the lens to the pupillary cavity if the implanted IOL is subluxated (8). In our study, the capsular tension ring was implanted in 3 cases (13%) due to insufficient zonular support. It has been reported in many publications that the possibility of post-operative inflammation increases in patients with narrow pupils (6). It has been described that prostaglandin release, which is defined in the mechanism of progressive myosis, a component of the floppy iris syndrome described in patients using systemic alpha-1A adrenoreceptor blocker, occurs by manipulations during iris surgery (9). Based on this information, it can be said that prostaglandin release will increase due to the increased manipulation of iris in patients with narrow pupils. Prostaglandin, which has an inflammatory effect in the development of postoperative anterior chamber reaction, therefore triggers the development of post-operative inflammation (10). Some systemic diseases should be questioned by surgeons, which may prevent the idealization of pupil dilatation. Diabetes mellitus disease is the most important among these diseases. Because of the accumulation of glucose products in the iris, the iris dilator muscles are exposed to stronger resistance and iris dilatation becomes more difficult (11). A second important disease is benign prostatic hypertrophy. Systemic alpha-1A adrenoreceptor blockers used for the treatment of this disease are irreversibly linked to iris dilator muscles. Atrophy occurs in dilatator muscles in the long term (12). Another condition associated with the use of this drug is the development of floppy iris syndrome (13). The components of the floppy iris syndrome are a flaccid iris during the surgery, a propensity for iris to prolapse towards the area of cataract extraction, and progressive intraoperative pupil miosis despite standard procedures to prevent this. In patients using systemic alpha-1A adrenoreceptor blocker, progressive narrowing of the pupillary diameter during the operation has been associated with prostaglandin analogues, which have been secreted due to microtraumas in the narrow pupil (9,12). In these cases, there is some information that the use of non-steroidal anti-inflammatory drugs topically prior to surgery may be useful in preventing progressive miosis (14). It should be noted that patients on systemic alpha-1A adrenoreceptor blockers should not undergo iris stretching to increase intraoperative pupil diameter. Iris stretching in these patients leads to further loss of the iris tone, making it easier for the iris to loosen and prolapse. The incidence of complications is higher when iris prolapse is seen in patients with narrow pupilla. In a study conducted in our clinic, it was observed that the rate of use of iris hooks in patients using systemic alpha-1A adrenoreceptor blockers was significantly higher than in our study. Since the ideal of pupillary dilatation is very important for the surgery, surgeons have searched for additional methods during the years when all other procedures failed to provide ideal pupil dilatation. The process of mechanically opening the environment to be operated is an important condition in every field of medical science. The use of mechanical effect and expanding tools has emerged in the light of these considerations. Pupillary expanding devices are annular devices and iris hooks. The ring-shaped devices dilate the iris more symmetrically and closer to the physiological state. The iris hooks pull the iris from the point of contact with the iris and increase the pupil width. In a study, Birchall and Spencer (15) compared the use of 5 iris hooks and 4 iris hooks. In the cases using five iris hooks, the total length of the pupilla opening was decreased by 17% compared to the cases using 4 iris hooks. Iris hooks are generally used to pull the pupil from 4 points. However, in cases where the iris is prolapsed from the main entry site, iridodialysis ocuured by attaching the iris to the PHACO end, the iris damage caused by maneuvers to insert the iris into the eye at the main entry site and decreasing the need for a corneasecular suture, a 5th iris hook can be used to stabilize the iris by subincisional implantation. Iris hooks can be used to mechanically provide pupil dilatation in order to avoid the difficulties and the complications that the narrow pupil will bring to the surgeon for PHACO surgery. The use of the iris hook is a tool that can be used as a weapon against the narrow pupil because of the relatively easy surgical training. However, surgeons should always be reminded that patients may have additional ocular pathologies and that surgical complications may be encountered despite the use of this device. Ethics Committee Approval: İstanbul Training and Research Hospital no: 1016. Informed Consent: All patients were informed about the study and their consent was obtained. Author Contributions: Concept - M.S.A., E.Ü., M.Ö.Ç., K.,E. ; Design - M.S.A., E.Ü., M.Ö.Ç., K.,E. ; Supervision - M.S.A., E.Ü., M.Ö.Ç., K.,E. ; Resources - M.S.A., E.Ü., M.Ö.Ç., K.,E. ; Materials - M.S.A., E.Ü., M.Ö.Ç., K.,E. ; Data Collection and/or Processing - M.S.A., E.Ü., M.Ö.Ç., K.,E. ; Analysis and/or Interpretation - M.S.A., E.Ü., M.Ö.Ç., K.,E. ; Literature Search - M.S.A., E.Ü., M.Ö.Ç., K.,E. ; Writing Manuscript - M.S.A., E.Ü., M.Ö.Ç., K.,E. ; Critical Review - M.S.A., E.Ü., M.Ö.Ç., K.,E. Kershner RM. Management of the small pupil for clear corneal cataract surgery. Journal of cataract and refractive surgery. J Cataract Refract Surg 2002; 28: 1826-31. Coşkun M, Anayol A, Altıntaş AGK, Çakmak HB, Şimşek Ş. Katarakt Sertliğinin Fako Parametreleri ve Komplikasyon Gelişimi Üzerine Etkileri. Glo-Kat 2006; 1: 279-83. Arıkan G. Küçük Pupillada Fako: İris Retraktör Kancalarıyla Pupil Dilatasyonu. Glo-Kat 2006; 1: 103-6. Lim LA, Frost A. Iris tears secondary to intraoperative floppy-iris syndrome associated with tamsulosin. J Cataract Refract Surg 2006; 32: 1777. Vielpau I, Billotte L, Kreidie J, Lecoq P. Comparative study of topic anesthesia and subtenon anesthesia for catarct surgery. J Fr Ophtalmol 1999; 22: 48-51. Arıkan G, Durak İ, Karahan E, Özbek Z, Yaman A. Küçük Pupillada Fako: İris Retraktör Kancalarıyla Pupil Dilatasyonu. Glo-Kat 2006; 1: 103-6. Yaycıoğlu RA, Akova YA. Kapsül Germe Halkalarının Klinik Kullanımı. Toft Gaz 2006; 36: 344-51. Köktekir BE, Aslan BS. Sublükse Kataraktlarda Alternatif Cerrahi Yöntemler. Glo-Kat 2010; 5: 134-7. Schwinn DA, Afshari NA. alpha(1)-Adrenergic receptor antagonists and the iris: new mechanistic insights into floppy iris syndrome. Surv Ophthalmol 2006; 51: 501-12. Öz Ö. Diabetik Katarakt Cerrahisinde Postoperatif Komplikasyonlar. Ret-Vit 2014; 22: 135-42. Yavuz L, Kuğu S, Yılmaz İ, Öztürk Y, Özertürk Y. Diyabetik ve Diyabetik Olmayan Hastalarda Fakoemülsifikasyon Cerrahisi Sonuçları. J Kartal TR 2013; 24: 103-6. Chang DF, Campbell JR. Intraoperative floppy iris syndrome associated with tamsulosin. J Cataract Refract Surg 2005; 31: 664-73. Flach AJ. Intraoperative Floppy Iris Syndrome: Pathophysiology, Prevention, and Treatment. Trans Am Ophthalmol Soc 2009; 107: 234-9. Altan-Yaycioglu R, Yaycioglu O, Gul U, Pelit A, Adibelli FM, Akova YA. The effects of two systemic alpha1-adrenergic blockers on pupil diameter: a prospective randomized single-blind study. Naunyn Schmiedebergs Arch Pharmacol 2007; 375: 199-203. Birchall W, Spencer AF. Misalignment of flexible iris hook retractors for small pupil cataract surgery: effects on pupil circumference. J Cataract Refract Surg 2001; 27: 20-4.